When traveling, Culture Keeper contributor Donna Ford discovers plenty of inspiration for her home’s interior. Here, she shares with us some of the style ideas she picked up as souvenirs in Morocco that are years later still showing up in her home design. From the decor of a luxury hotel to the energy of the medina, inspiration abounded during this North African getaway with her husband, John Ford. Five years ago, my husband and I planned a trip to Morocco to celebrate my 30th birthday (little did we know then that it would be our last child-free holiday for a long time!). Ever since reading the Alchemist by Paolo Coelho in my early twenties and being inspired by the young Andalusian shepherd protagonist, who searches for his treasure by traveling through the southern desert of Spain into North Africa, I had dreamt of travelling to Morocco. So we booked a September trip (which, by the way, is the cheap, low season, due to the high temperatures) to Marrakech with a few days by the coast in Essaouira. Morocco oozes style and sensuality: offering varied textures and patterns to touch, an array of colors that are so vibrant in the desert sun, the smell of tagine, the spices that will make your tastebuds explode, and the intriguing music that you cannot stop yourself moving to. 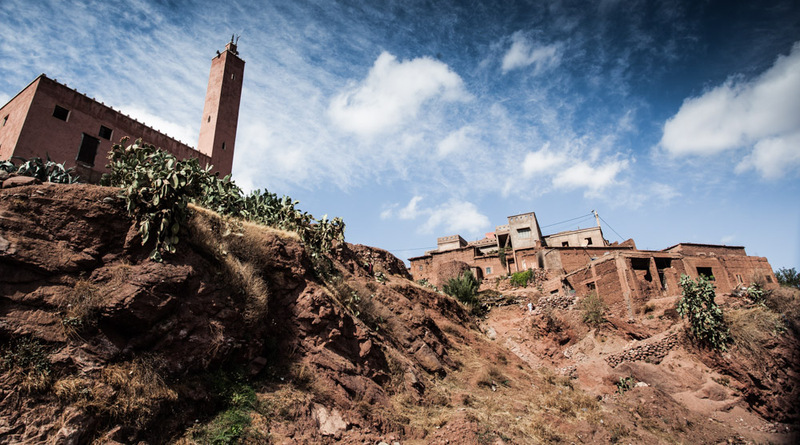 It is a truly exceptional place to visit, and although you think you know what you are going to get from Moroccan culture, surprises abound at every turn. We stayed in a couple of different riads and hotels, but the highlight was a luxury two-night stay in Marrakech’s Les Deux Tours. It’s situated in the lush Palmeraie just north of the city. This palm grove of several hundred thousand palm trees is a huge oasis of calm outside the bustle and craziness of the medina in the city centre. Les Deux Tours brands itself as a hotel “impervious to fashion and the passage of time,” so it's intentional that the interior and exterior design weaves between styles. Not so oldy-worldy as central Marrakech (where I was convinced I'd bump into Aladdin any minute! ), the hotel is instead more modern luxe with a little bit of minimalism in the rooms and gardens. We were upgraded to a junior suite, and I loved the rooms’ space and airiness. I also adored the vaulted ceilings and hidden alcoves and of course the zellige tilework (mosaic colored tiles) so synonymous with Morocco and with Islamic art. The hotel creates an atmosphere imbued with Orientalism to remember the “best of times” in Marrakech, and I can't help but feel there is a hint of colonial style too with the oversized plants everywhere. It has a sophisticated maturity in comparison to the childlike playfulness of the souks in town. My experience here was one of complete luxury and relaxation—from the special birthday meal of incredible Moroccan tagine (apparently traditionally only eaten by men) and champagne by candlelight outside in the warm desert breeze, to the beautiful hammam and spa. While the respite from the excitement and frenetic atmosphere of central Marrakech was all we’d hoped for, my most lasting memory of our stay was actually the decor. I remember feeling incredibly sad sitting in the luxuriously cozy bar choosing my last cocktail and letting the rich colors of the space just soak over me. It broke my heart to leave this moment behind. We'd actually misplaced the pictures from this trip on an old broken hard drive, and in rediscovering them, I find that years later I can still recall the colors and design of this room from memory. The play of the reddish pink against the emerald green is actually a look that is bang on trend at the minute. I'm not normally one to follow current trends, but this is one I've liked for a while. It's a surprisingly great color marriage! There's also some purple velvet thrown into the mix and patterned flooring and of course the ceiling is the same color as the walls, creating a cozy enclosed look. This maximalist and layered choice of decor has clearly influenced my decisions since returning from this trip five years ago when we had just bought our rundown house which needed a lot of love and redesign. There is such an experimentation of color, texture, and pattern in Morocco that can impact rooms back here in the U.K., or wherever you happen to be living. I'm convinced that in order to create an interesting and relaxing space it's important to not be too matchy-matchy. Of course there needs to be a considered aesthetic and a general sense of how each element of the room compliments each other, but the only way to discover this delicate balance is to experiment! Get testers of fabric and paint and create your own moodboard (basically stick everything on a piece of cardboard together) and see if you think it “goes.” You'll be really surprised what works. And remember the real question is "Do I like it?" You're not creating a room in your house to be enjoyed by anyone other than you and your family. One of the design qualities I adored everywhere we went in Morocco was the tadelakt walls. This waterproof plaster surface looks similar to polished concrete, but it can be created with different colored pigments. I think in a modern scheme it can give a bit of an industrial look. It can form seamless curves and its undulating character makes it perfect for baths and sinks as well as walls and ceilings. Tadelakt was traditionally used in Moroccan palaces, hammams, and bathrooms, and the recent restoration of riads in Morocco have led to a resurgence in its use. If you’re a fan, you’ll be glad to know you can achieve this look in the U.K. with local tradespeople such as Tadelakt London. You can get a real sense of how the plaster is molded in the hammam below where I spent the day of my 30th birthday at Les Deux Tours (a little piece of heaven in my opinion) and you can see how this wall covering gives that iconic Moroccan look. In Marrakech we stayed down a little red-walled street in a beautiful and extremely affordable place called Riad Ilayka where it was relatively quiet in comparison to the main square, Jemaa el-Fnaa, which was only a few minutes away and is constantly buzzing with life. Mosaic walls and dark interiors were mostly the theme here. In the medina itself, there was so much to discover around every corner—from the tanners, to the street merchants, to the solace of the old madrassas. These few photos offer a glimpse of what we found there, but there are so many more hidden gems to explore and locals to meet. While any mention of Morocco instantly conjures up images of bright colors, Le Jardin Majorelle offers one of the country’s truly colorful experiences . Owned at one point by Yves Saint Laurent and surprisingly cubist for North Africa, Le Jardin Marjorelle is billed as one of the most visited sites in Morocco. The vibrant hues and exotic plants make it an unforgettable experience long after you return home. Located just north of the medina, this part of Marrakech is more modern and refreshingly artistic, and we kept stumbling across inspiring photography exhibitions and restaurants with a twist on traditional Moroccan cuisine. With three large renovations under her belt, Donna Ford began an award-nominated interiors blog to share with others what she’s been learning. As she expands into offering affordable interior design services, she has discovered the relevance of her previous life as a dance artist and her experience in arts management and as a mentor and teacher. She lives in and renovates a 1930s home in South-East London with her Director of Photography husband John and their two gorgeous little boys. Find her also on Instagram, Facebook, Pinterest, and Twitter. Learn more about John Ford's photography on his website.